It was in 1952 that Hasbro released its very first Mr. Potato Head. This children’s toy was originally produced as separate plastic parts with pushpins that could be stuck into a real potato. 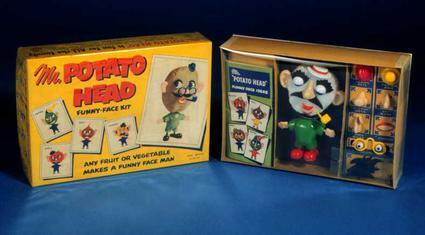 But since potatoes go bad and parents were complaining that their children’s were rotting, Hasbro introduced a plastic potato body with the set in 1964. The toy has gone on to be such a hit over the years that I even dressed up as Mr. Potato Head for Halloween. After what seemed like a no-brainer idea 25 years ago, Hasbro have finally decided to release the Homer Simpson Mr. Potato Head. This is the $18 Homer Simpson Mr. Potato Head Doll sold at Entertainment Earth. Unfortunately the Mr. Potato Homer doesn’t come with interchangeable parts, but it’s still a pretty cool collectable for Toy fans and Simpsons fans.